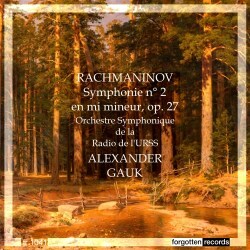 Alexander Gauk has been relatively well served by one or two companies determined to bring back some of his discs to the fold (try Brilliant Classics). Even so his discography encompassed recordings that have largely evaded the restoration arms of all but the most questing of labels. It’s perfectly possible that this Melodiya disc, which earned greater exposure in the West when it was leased to Westminster, has made it to silver disc though, if so, I’ve not come across it. Gauk excelled in a number of areas – he’s not just one of the great Miaskovsky conductors – but his particular expertise was largely in his native repertoire. Given his intense approach Rachmaninov would seem a perfect fit. He accompanied Lev Oborin in a 1947 recording of the Second Piano Concerto – now to be found on APR – and this 1955 LP of the Second Symphony reflects the romantically expressive affiliations he displays in that concerto performance. The glowering basses and yearning winds are all very distinctive given the USSR Symphony is involved, and the orchestra as a whole copes well with Gauk’s heady and dramatic propulsion, his accelerandi through the music’s paragraphal points. Gauk was always very good at power and glower, and he shows how well he prepares for the apocalyptic outbursts in the first movement, at around 12:40 – the brass and percussion reflecting the tumultuous switchback theatre he has set in motion. In the scherzo he finds moments that are almost festive, and others that are martial – the return to the tempo primo bringing with it a satisfying circular sense of motion. His plasticity of phrasing pays particular dividends, naturally, in the slow movement where the clarinet principal is not encouraged to linger too sentimentally or melodramatically. Waves of expression course through the movement – not volcanically as with a conductor like Golovanov – but with a degree more restraint. The finale is strongly characterised and projected, forming a turbulent coda to a notably self-assured and attractively warm-hearted, soulful reading. There are, however, the-then standard cuts. The transfer has been taken from a Westminster LP, and has been very well done indeed. Gauk aficionados should track this down – obviously other options from younger Russians such as Svetlanov and Rozhdestvensky are better recorded.